Jacks has everything you need for your Briggs and Stratton fuel system needs. If a replacement fuel filter will get you running again, Jacks can get them for you. With E10 fuel being the standard, installing a fuel shutoff valve or a way to safely drain your fuel tank is a good idea. Jacks has fuel line, fittings, shut off valves, hose clamps, and more. 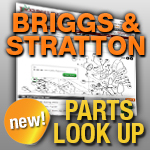 If you need parts for your Briggs and Stratton Fuel System, chances are, Jacks can get it for you. Look below to get started shopping.